Rodney Culver, from Detroit, was the starting tailback (and first African-American Captain) at Notre Dame in 1990 and 1991. He was drafted in the 4th round of the 1992 NFL draft by the Indianapolis Colts during the ‘dark days’ of the franchise (before the current ‘golden age’ of the Manning Era). With the departure of Eric Dickerson the team was going in a new direction at runningback and had a platoon of players at the position. Culver was used primarily as a goal line and short yardage back. He played in 1992 and 1993 for the Colts, before signing with the Chargers in 1994. 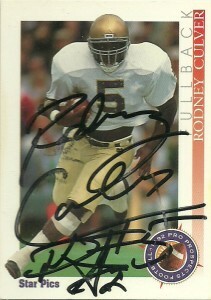 I’d get Rodney’s autograph during a blitz of the Colts franchise back in 1992. His autograph oddly has 2 numbers on it- his college number and a star with a 2 next to it. I have assumed it meant it was the second Star Pics card he signed. Culver played in San Diego for an additional two seasons in another platoon system, making an appearance in the Superbowl for the Chargers, after the 1995 season. Over his short career Culver showed flashes of starting potential, was a tireless team player, and dedicated hard worker. Full of wisdom beyond his years and an inspirational presence, Rodney was also a devout Christian going as far as when he’d score a touchdown he would point towards the sky in thanks. On May 11th, 1996 shortly after takeoff from Miami, Rodney and his wife were tragically killed when their flight, Value Jet 592 crashed in the Florida Everglades killing all 110 on board. The crash would highlight massive oversight failures by the airline industry when dealing with safety, contractors, and transportation of potentially hazardous materials on commuter flights. In 1999, on the 3rd anniversary of the disaster, a memorial was dedicated to the victims of flight 592 in Miami-Dade county. Truly an unsung and quiet player, leaving us before his prime- Rodney Culver is another example of a exactly why I have been putting these autographs on my site. It’s not fair- really- and this is the best I can do to remember players like Rodney.